The earliest version of Pai Gow was played with tiles. 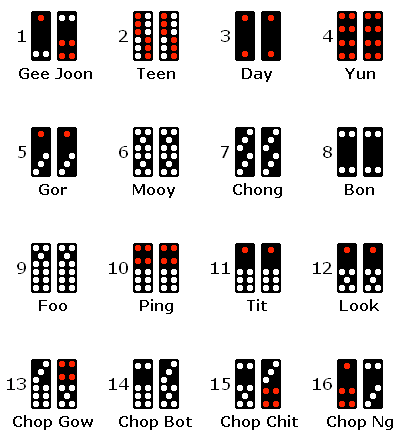 Tiles or dominoes as they are called are used mostly in Chinese version of Pai Gow game. Many new players find it difficult to play Pai Gow Poker with tiles. But once any player learns and understand which hands and tiles beat others, he or she will use tiles in Pai Gow as an expert. How to Play Pai Gow poker with tiles? At the start of the game a hand of pai gow begins with all 32 tiles being shuffled. Each player makes a bet, and receives four tiles; the dealer also takes four tiles for their own hands. The players now look at their tiles, and arrange them into two separate hands of two tiles each. The lower value hand is known as the front hand, while the higher value hand is the rear hand. After all players have made their decisions on how to arrange their hands, the dealer does the same, arranging their tiles according to the “house way” rules that dictate how they must play. Once the dealer’s hands have been arranged, his hands are compared to those of the player. Front hands are compared to each other, as are rear hands. If the dealer wins both hands, the player loses their bet. If the player wins both hands, they win even money on their bet, minus a 5% commission. Finally, if the player wins one hand while the dealer wins the other, the bet pushes. Hands are normally scored by adding the total number of pips on the two dominoes and dropping the tens place. For instance, if you have a tile with 4 pips and another with 11 pips, you have a total of 15. Dropping the tens place, your hand is scored as 5 points. Keep in mind that the Gee Joon tiles – the 1-2 and 2-4 tiles – can be counted as either 3 or 6 pips. It is possible to have a zero point hand (for instance, if you have 10 or 20 total pips). However, there are ways to score more than nine points on a hand. The double-one (two pips) tiles are known as Day tiles, while the double-six (12 pips) tiles are known as Teen tiles. If you use one of these tiles with an eight, your hand is called a Gong and is worth 10 points, rather than zero. Similarly, if you use one of these tiles with a tile with nine pips, your score is 11, rather than 1; this is called a Wong. Finally, you can sometimes use two tiles together to make a pair, which beats any non-pair. One easy way to remember this is to consider pairs as being worth 12 points. Some of the pairs are obvious, because the tiles are identical; other tiles form pairs by tradition, as they have the same number of pips, but are not identical. The best pair, the Gee Joon tiles, may not seem to “match” at all, unless you consider that they can both be used as “wild cards” during normal play. If two non-pair hands have the same score, the same rankings are used; the hand which has a tile that ranks higher on the above chart wins. However, the Gee Joon tiles are considered to have no value when breaking ties, and the banker always wins 0-0 ties. Also learn that there are three ways to play any pai gow hand. The key decision is to decide whether to balance your hands, or to make one hand unusually strong (either a very strong rear with a very weak front, or a strong front that is almost as high in value as your relatively weak rear hand). Remember that it is sometimes better to play defensively and simply try to win one of the two hands to force a push, especially when it is very unlikely that you will be able to win both hands. Again if you are still not able to understand how to play with tiles then better ask the dealer at the Pai Gow Poker table in real land casinos to simply set your tiles in the house way. If you are playing Pai Gow tiles at online casinos then there is often a house way button that will arrange your tiles for you.